​Alaska Roof Coatings specializes in cost-efficient restoration of existing flat roof, low slope & metal roof systems. We are the responsible roofing solution that saves you thousands of dollars by eliminating the need to tear off and replace a leaky roof. 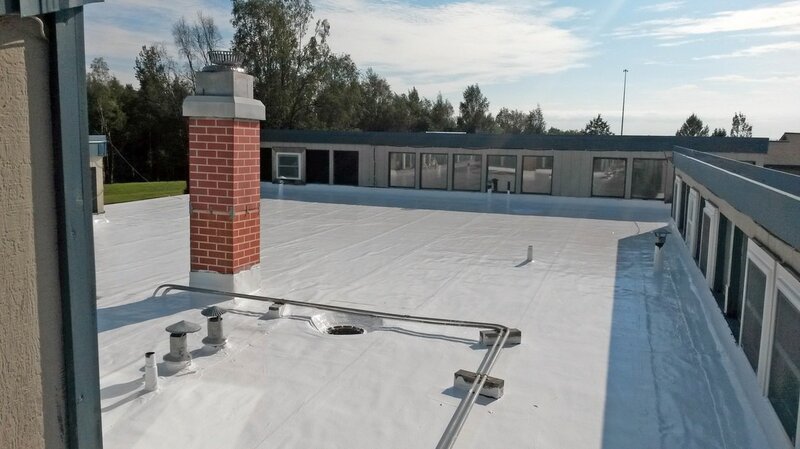 Our seamless silicone coatings are applied directly on top of the existing roof material and will last for the life of the building when properly maintained. Our 20 year warranty is renewed by simply applying an additional layer on top of the initial coating. As the only contractor in Alaska to specialize in flat roof restoration coatings, Alaska Roof Coatings gives you a sustainable and renewable roof restoration option that saves you the money and headache of a traditional tear-off/reroof project. We invite you to learn more about our company and for a free project estimate. Contact us today at (907) 952-0944. A traditional tear-off/reroof project is expensive, labor intensive and overall just a headache to run. Plus the traditional flat or low slope roofing techniques leave seams in the membrane that break down overtime and lead to costly roof leaks. Our restorative liquid roof coatings are applied directly on top of the existing roof material. The coating creates a durable, seamless membrane that instantly seals out water. The application requires less labor time than traditional roofing methods and no materials go to the landfill. This translates into a substantial savings of both time and money. Call us today to get a free estimate and learn more about Alaska Roof Coatings. A typical reroof involves an expensive tear-off of the existing roof material. All of that debris and material is just dumped into a landfill. With the ARC roof system the tear-off is unnecessary. Our restorative roof coating are applied directly on top of the existing roof, reducing the labor cost and keeping massive amounts of material out of the dump. Additionally, the maintenance of the roof is as simple as the initial treatment, so the roof can effectively last for the life of the building. Go green with Alaska Roof Coatings. We offer a 20 year warranty on the integrity of the roof coating. Yearly inspection and maintenance is required to maintain the warranty. When you reach the end of the warranty period we will renew the warranty for another 20 years by simply applying an additional coating to the roof on top of the initial coating. This ability to reapply and renew the warranty means that the roof coating can last for the life of the building, saving you thousands of dollars upon each renewal. We encourage all customers to allow Alaska Roof Coatings to do the yearly maintenance required to maintain the warranty.